Jesus did some unconventional actions while He was here on earth. One of those events included speaking to the Samaritan woman at the well. Why did Jesus do this? 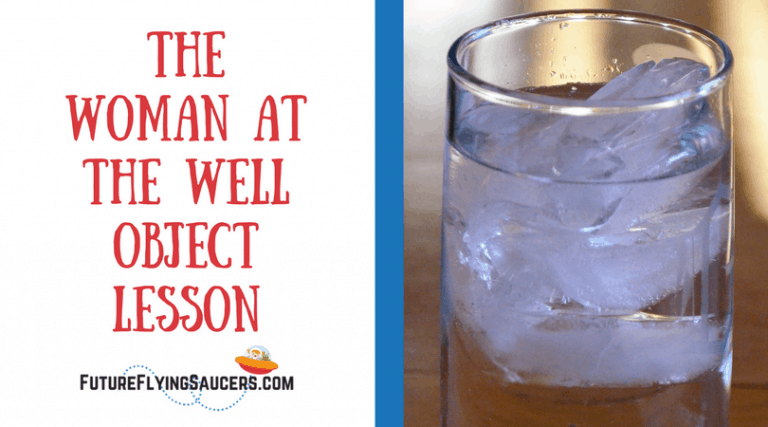 Use a glass of water to teach children about the Living Water. Background: Jesus chose twelve men to mentor and prepare for ministry. Jesus and Nicodemus had an amazing conversation about a second birth. There was a group of people who were hated by the Jews, but Jesus disagreed with this. After the Passover, Jesus started having some issues with the Pharisees, so He decided to leave the area of Judah and go back to Galilee. He went through Samaria, which is interesting because a “good Jew” would never go through Samaria. Samaria was a country filled with, what the Jews considered, half-breeds. (For more info see Ezra.) These were people who were brought to the area during the years of exile and they intermarried with some of the Jews. Therefore, a “good” Jew would never want to be tainted by these people, so they would walk around the area of Samaria traveling many miles out of the way. 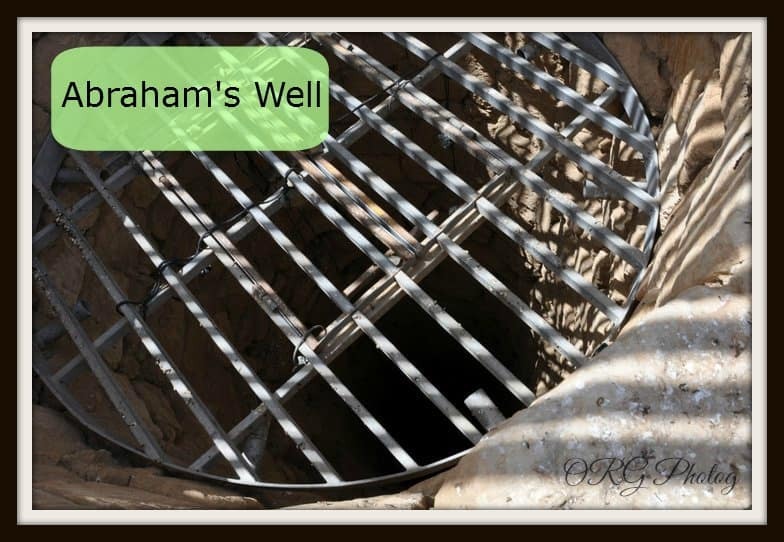 These two pictures come from Abraham’s well and not Jacob’s, but you can see what the well might have looked like. But not Jesus. 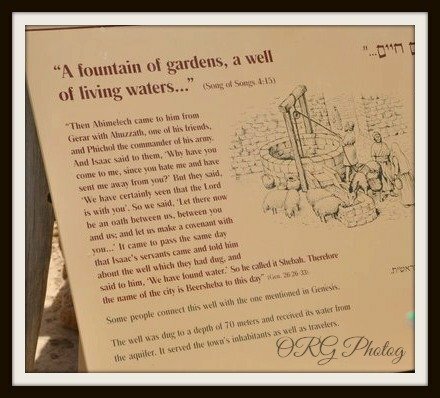 He went through the area to Jacob’s Well in Sychar. There he met a woman. This woman had a history of not making wise decisions. The disciples went into town for food and Jesus asked her for some water. This took her by surprise! #2) Jesus was a Jew. Woman: You, a Jew, are asking me, a Samaritan, for water? Jesus: If you knew who I was you’d ask me for living water. Woman: You have no bucket and the well is deep. Where do you get this living water? Are you greater than Jacob? He gave us this well. Jesus: If you drink this water, you will be thirsty again. If you drink the water I give you, then you will never be thirsty again. The water I give becomes a spring and will well up to eternal life. Woman: I want some of this living water! I don’t want to have to come and draw water again. Woman: I don’t have a husband. Jesus: You are right. In fact you have had five husbands and the man you are with now is not your husband. Woman: Sir, I think you are a prophet. These wells were very deep! The woman then proceeded to change the subject and asked Jesus where people should worship God. In Samaria? or only in Jerusalem? He responded that the time had come for people to worship in spirit and in truth and that it didn’t matter where one worshiped. The fact that Jesus revealed who He was to a Samaritan woman is important. It is important because Jesus valued women while living in a male dominated society. She was also a Samaritan which teaches us that Jesus values ALL people, no matter their culture. She was also a woman who had had five husbands. This teaches us that Jesus values people no matter what poor choices they have made in life. The disciples returned to Jesus and were amazed to find Him speaking to this woman. 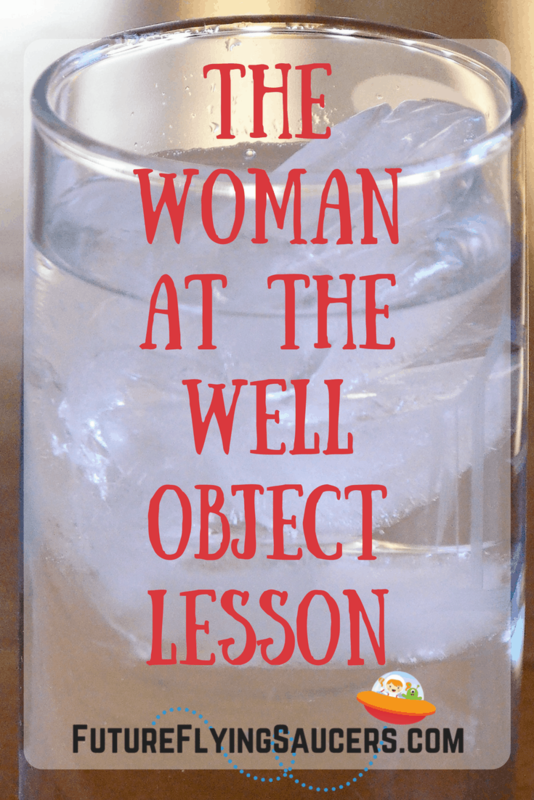 The woman left her water jar, ran to town, and said, “Come meet the man who has told me everything I have ever done. Can this be the Christ?” The whole town went out to meet Jesus. The whole town came out to meet Jesus. One woman told her testimony, or her story, and many in the town believed in Jesus. This is what happens when you share your Jesus story. When you meet Jesus, you can’t help but tell others about what happened! The living water that is in you will spread onto the person you tell. When the disciples came back to Jesus, they tried to get Him to eat food, but He refused. He said, “My food is to do the will of God.” He told the disciples to lift up their eyes. The fields were white with harvest. In other words, the people were ready to hear what He had to say and the people of the town were on their way. That woman told her Jesus story and the people came running to hear the gospel. Jesus came to be the Living Water. And as people believed, they then went to others and told their Jesus story. And so the living water bubbled over and spread. If you aren’t telling other people your Jesus story, then you aren’t spreading the water. Allow His water to bubble out of you! What can we learn from the words of Jesus? We must choose to believe in Jesus so we can have Living Water to share with others. That Living Water gives us eternal life. Teach your kids this fun song about Jesus’ love bubbling over. I learned the song with the word “soul” instead of “heart”. But either works!